When I first spoke with “Professor Blade” I noticed a subtle accent; “Former British Army” he informed me, though he now resides in the San Diego area. In addition to his accent, I noticed he was remarkably polite and articulate, which isn’t surprising given his career as a middle school teacher and college professor. What IS surprising however, is the fact that this man was recently arrested, charged with a felony and held on a $125k bail. So why was this man, former military and college educator without any criminal record arrested? He says he was profiled by California State police, simply because he was riding a motorcycle. Though entertaining, bikers openly mock the hit TV show, “Sons of Anarchy” which portrays a fictional outlaw motorcycle club as murderers, rapists and drug addicts who all use excessive violence to get what they want. Unfortunately, for the 8 million Americans who ride, perception can be reality. Professor Blade and members of his motorcycle club “The Chosen Few” know this all too well. He says he and his fellow club members have been targeted by local law enforcement for years. “There’s a bar we all go to pretty regularly,” Professor Blade tells me. “The night I was arrested I was there for a party for a friend who is in the marines. When we arrived, I could see police staked out across the street from the bar, just watching and waiting.” Upon leaving the party he was pulled over the second he turned out of the parking lot on his motorcycle. The impetus for the stop? Loud pipes—a reason Professor Blade finds suspect given they were in close proximity to the Miramar Air Station. “It was so loud we couldn’t even hear the sound from the police dash camera. 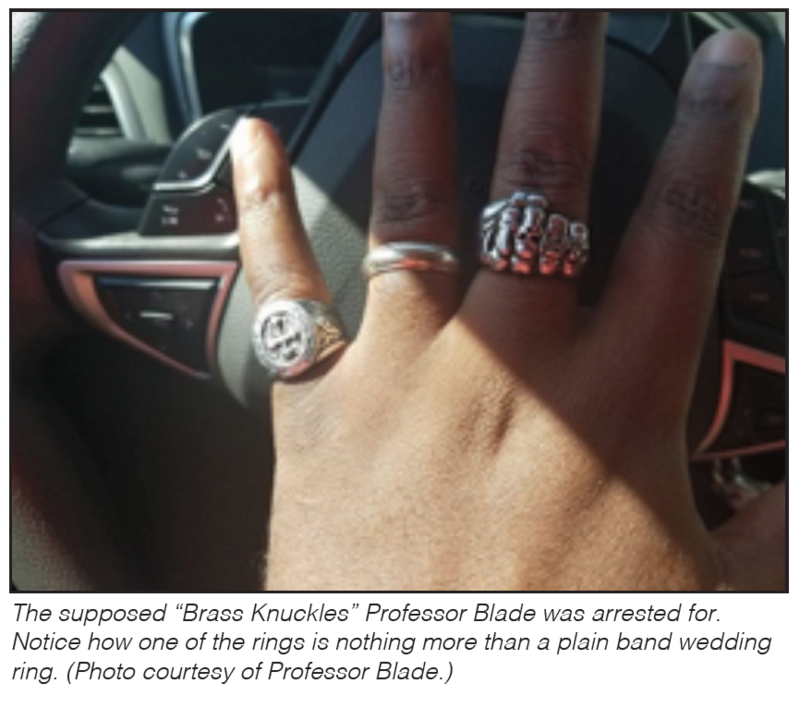 There is no way he heard my pipes which are in full compliance with California state law.” Ultimately, Professor Blade wasn’t cited for his pipes, but he was questioned about the leadership of his motorcycle club and then arrested for possession of brass knuckles and a deadly weapon. One of the “brass knuckles” that prompted his arrest? His wedding ring. The deadly weapon? A 24-inch decorative whip that was zip-tied to his handlebar on the throttle side. Police arrested him, confiscated his bike and a judge set his bail at $125,000. It would be unfair to pin the perception of equating bikers to criminals solely on the show, Sons of Anarchy. There are legends and lore about bikers from movies to music and throughout American pop culture. The “bad boy” biker narrative has grown over time and though entertaining, it’s resulted in some real (and not so entertaining) consequences. The Motorcycle Profiling Project (MPP) has been collecting research for two years capturing data and information from motorcyclists who feel they have been profiled by law enforcement for riding a motorcycle or wearing motorcycle-related attire. According to the Motorcycle Profiling Project, 28% of respondents felt they had been profiled. Though the data from 2016 is still being reviewed, early indications show that this number will grow exponentially. The state with the highest reported incidents of profiling? California—which is where Professor Blade was arrested. Though incidents of profiling certainly are not limited to California. Every single state has reported instances of motorcycle profiling according to the MPP. And while California is the biggest offender, Texas, Florida, Arizona and Pennsylvania rank in the top five. The state at the bottom of the list with the lowest incidents of reporting? That would be Washington state which passed a law in 2009 requiring law enforcement trainees to undergo training specific to addressing motorcycle profiling and best practices when stopping a motorcyclist. According to the MPP which spearheaded the Washington law, it’s working. In fact, reported incidents of profiling have been reduced over 90%. Maryland passed a similar law in 2016 and several state legislatures will be considering similar bills in their next sessions. Even our federal lawmakers have shown an interest in the issue with the House and Senate each introducing legislation (S.Res.154, H.Res.318) addressing motorcycle profiling in May of this year pushed by the Motorcycle Riders Foundation. No one should make the argument that criminal elements don’t exist in the motorcycle world. A quick google search turns up many reports of bikers arrested on drug charges and domestic violence among others. A 2015 report from the FBI on gangs identifies outlaw motorcycle gangs (OMG) as a concern stating that motorcyclists have evolved from “bar room brawlers” to “sophisticated criminals.” However, according to the report, when looking at gangs and gang members as a whole, 88% are attributed to street gangs, 9.5% to prison gangs and only 2.5% are attributed to motorcycle gangs. And yet, according to Vox Media, a recent survey showed that 14% of law enforcement officials identified motorcycle gangs first among the most problematic gangs in their jurisdictions; a figure that doesn’t add up when reviewing where motorcycle gangs actually fall on the spectrum. 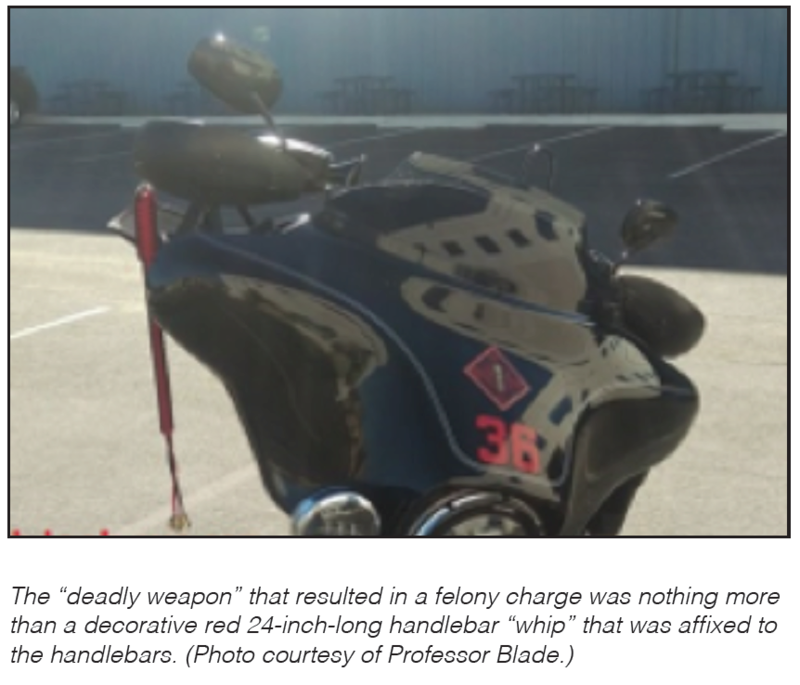 Professor Blade, whose real name is Flavius A B Akerele III, ultimately plead to a misdemeanor for possession of the decorative whip that hung from his handlebar. But the consequences didn’t stop there. As a result of his misdemeanor, he has lost his right to own a gun for three years—a hefty price to pay for an enthusiast and someone professionally trained in firearms. And despite the felony charge being dropped, the pending charge affected his background check when he was exploring a new position with a community college. And just recently, he was pulled over yet again upon leaving the local Harley-Davidson dealership where he says that once again, police were set up watching who entered and exited on motorcycles. So while the “bad boy biker” persona is iconic and the popular image of bikers as degenerates and hooligans makes for good TV, there are practical effects for your average motorcycle rider. When I ask Professor Blade what he wants others to know about his lifestyle and his story he tells me, “This is the kind of harassment I see on a daily basis. Bikers aren’t criminals. They are our country’s nurses, firefighters and teachers. We are being targeted for simply existing.